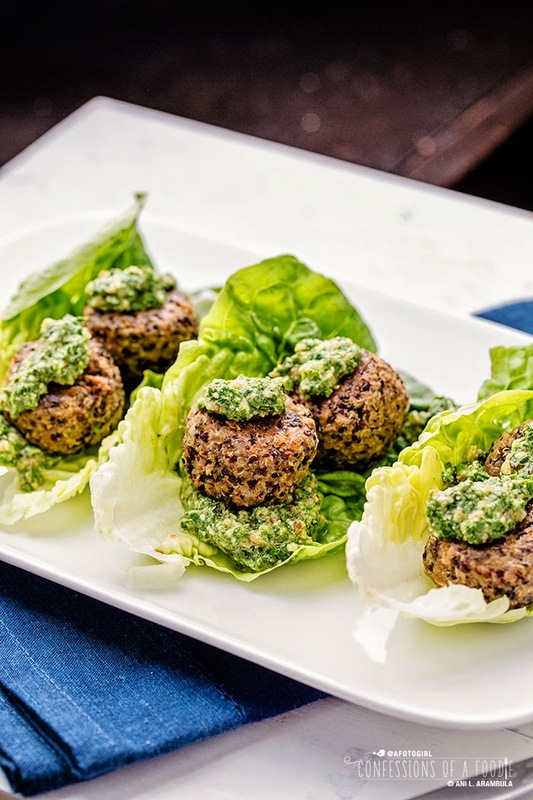 Baked, not fried, these quinoa balls pack a nutritional wallop with the addition of beans, mushrooms and a bright lemony walnut pesto. Perfect for #MeatlessMonday and lent. 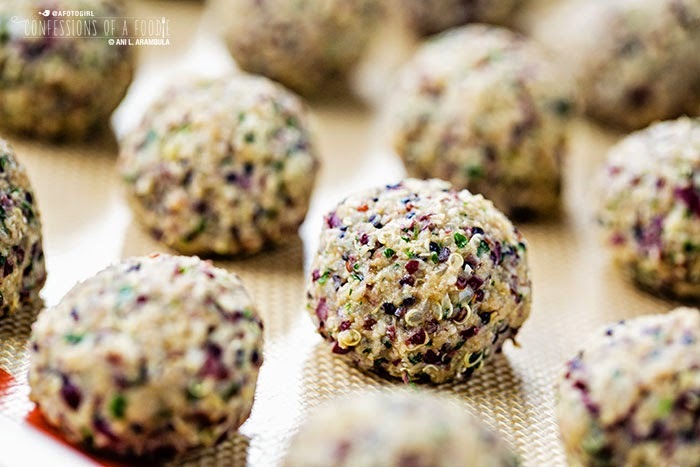 Reminiscent of falafel in texture, these “meaty” quinoa balls are so good, you won’t miss the meat. Perfect for Meatless Monday and lent. Falafels were my introduction to Middle Eastern food. The first time I had one was at a little Middle Eastern dive in Berkeley while I was away at art school. The art school I went to was in Oakland right at the border of Oakland and Berkeley. College Avenue connected my school with UC Berkeley. It was about a two mile walk each way. I spent a lot of time walking that street, exploring little coffeehouses and divey eateries that catered to the college crowd. There were burger joints, taco shops, and a Middle Eastern walk up closer to UC Berkeley that introduced me to hummus, baba ghanoush, tabbouleh and of course, falafel. 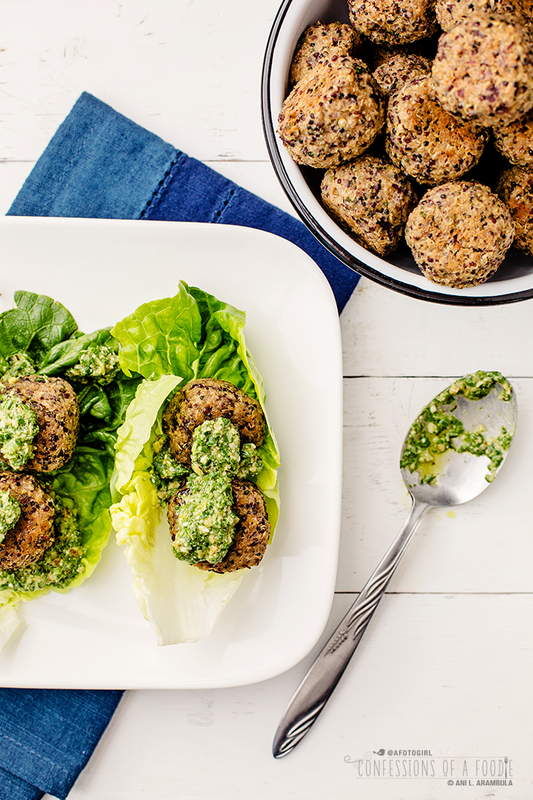 When I was thinking about what kind of dish I wanted to make for this Meatless Monday post, my daydreaming took be back to those college days and that falafel and I thought, what can I do to make my version that wouldn’t need to be fried? I wanted it a little lighter, packed with nutrition and able to serve wrapped in a crisp baby lettuce leaf so that I could keep the carbs down but still have the “ball” of whatever it was be as satisfying as it’s deep fried inspiration. Thinking back to the success I had for this quinoa potato patty from last year, I knew I wanted the base to be quinoa. I wanted this experiment to be “meaty” like veggie burgers which are often made with beans and mushrooms. So those went in, too. I also wanted citrus. And an herbaceous dressing as opposed to a heavier hummus or creamy yogurt. 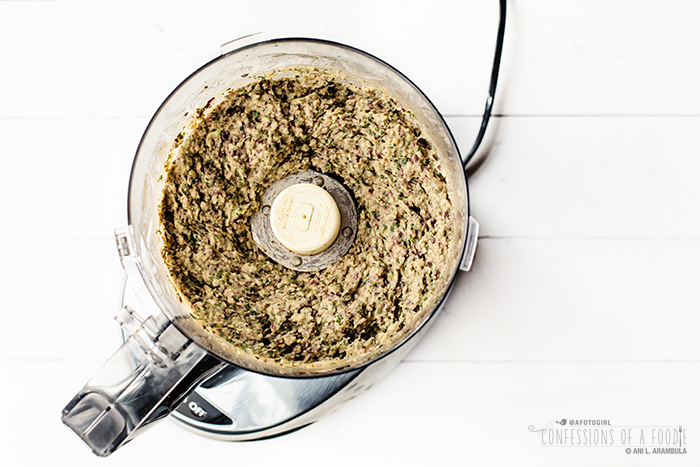 Again, thinking back to that quinoa patty and how successful the marriage between quinoa and pesto was, I opted for a new-to-me version of pesto that has been dancing around in my head for years: walnut pesto with the addition of arugula. And because I love arugula salad dressed simply with a splash of olive oil and a squeeze of lemon, I knew lemon had to make an appearance as well. 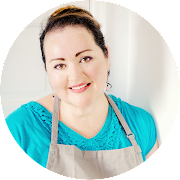 You know what I love about cooking and coming up with my own recipes? 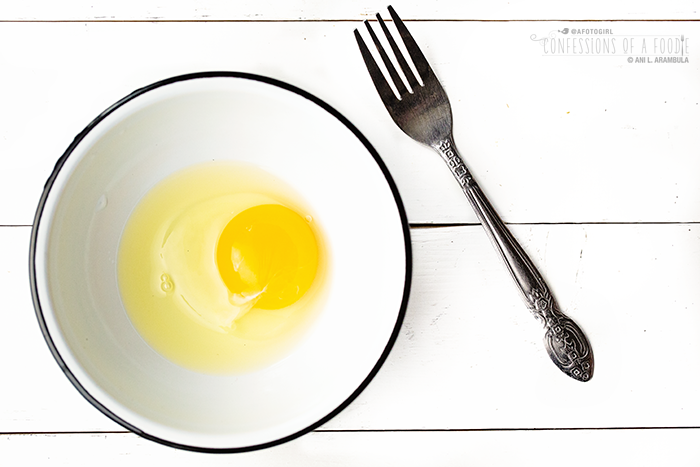 The fact that one spark of an idea can lead to the creation of an entire dish. Fearless trial and error can help you acquire an understanding of what flavors go well together – or have the potential to go well together – even if you’ve never tried the combination before. This dish was a success the first time out. 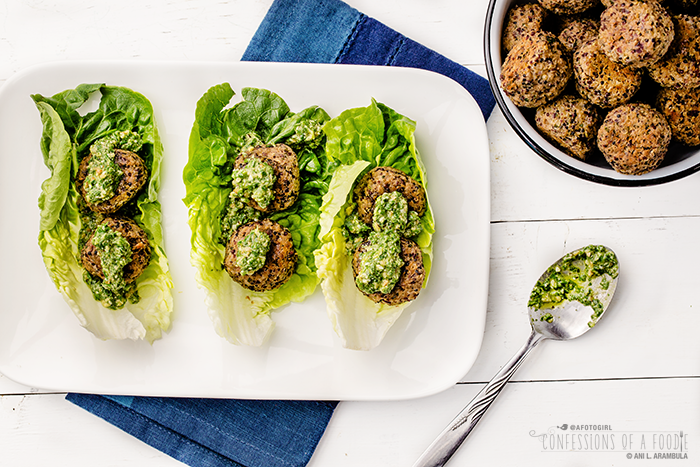 It hits all of my favorite marks: the comfort of a healthy grain, the protein wallop from beans and mushrooms, crispy crunch from the fresh lettuce wrap, the fresh peppery, lemony, nutty, basil pesto with a hint of cheesy goodness. To boost the nutritional value even more, I’ve also added some nutritional yeast flakes. First time using this stuff and I gotta say, it’s a tasty, easy way to add tons of Vitamin B (especially important for anemics and diabetics). It also contains all essential amino acids so it’s a complete protein that also adds fiber. It’s a great supplement not only for diabetics but it’s equally beneficial to paleo and vegan lifestyles. The brand I bought is non-GMO, dairy and wheat-free. It smells just a little cheesy and tastes slightly nutty and I’m really excited to continue experimenting with it. Expect to find it making an appearance quite often in coming recipes. It’s great as an additive to smoothies, sprinkled on popcorn, tossed into salads, added to soups and pretty much can go into any dish when you want a nutritional punch. A big hug and thank you to my sister, Barb, for coming over and helping me make these. It's such a joy to have "action" shots. Seriously. Balancing the camera with one hand and trying to pour/stir/measure with the other while attempting to capture it on camera is frustrating to say the least. Having help, especially for recipe like this, made it so much more fun! 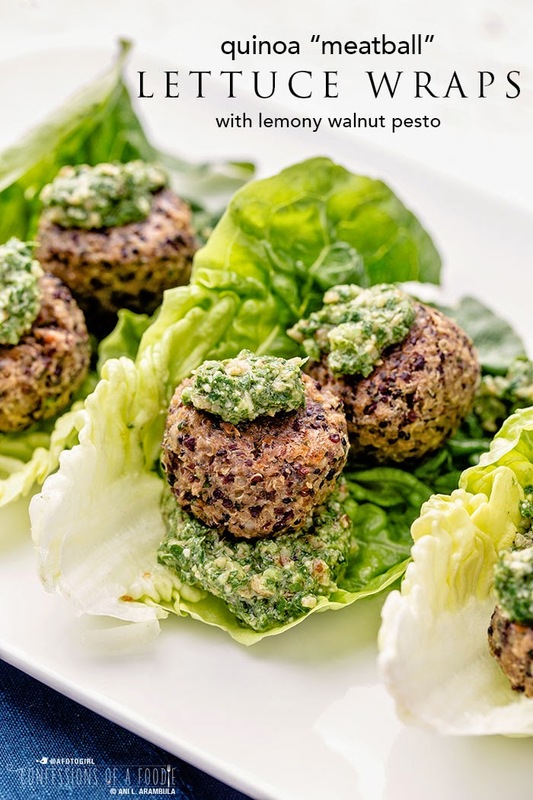 Ok, so as an aside and just between you and me, I toyed with the idea of calling these guys Quinoa Meat-less Balls but chickened out and went with the safer Quinoa “Meatballs” instead. Groan. I know. Oh well. Never mind what we call ‘em. Just make ‘em. Until next time, guys … happy eats! Use a cookie scoop to make consistently sized meatballs, scraping it on the side of bowl to level it off. Wetting your hands well before rolling will help cut down on the sticky factor. I used a Silpat to line my rimmed baking sheet for the balls but parchment will do. You could forgo lining altogether by spraying the pan generously with cooking spray but I wanted more control over the browning and caramelization so I opted for Silpat. To reheat, simply microwave a few minutes or, if you want them crispier, place them in a cast iron skillet with a bit of cooking spray (or olive oil) to heat through. 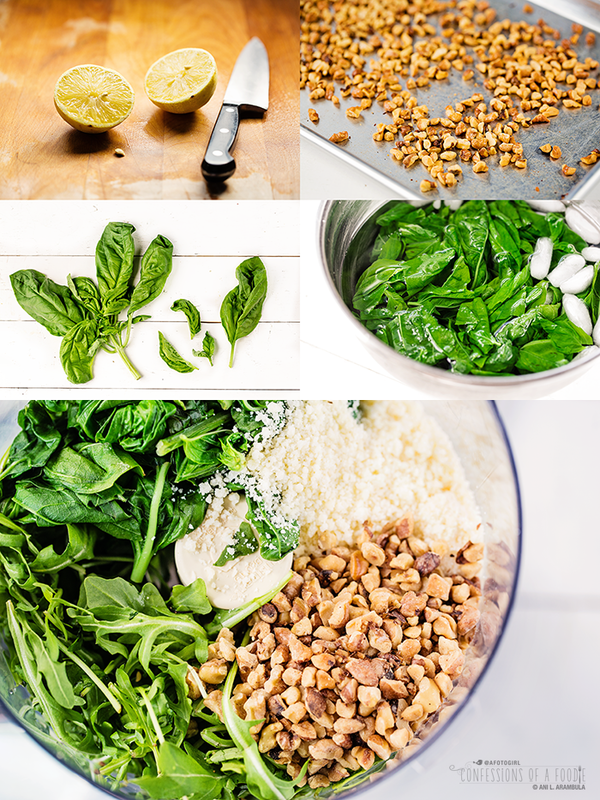 To keep the pesto staying a vibrant green, the basil leaves are quickly blanched in boiling water then shocked in an ice bath to stop the cooking process, locking in that gorgeous bright green color. 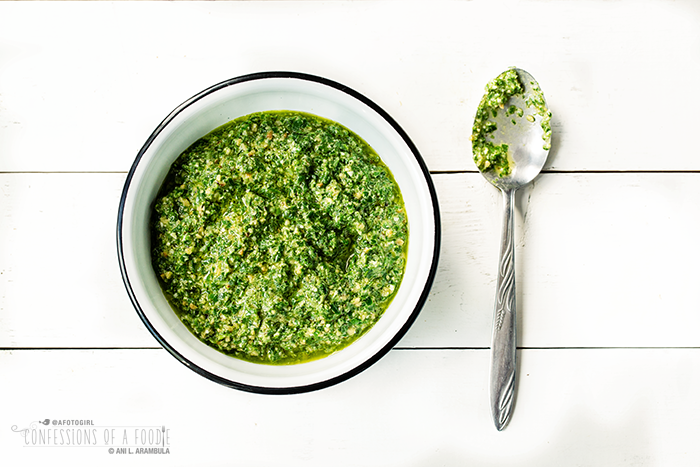 Leftover pesto can be stored in an air-tight container for up to a week in the refrigerator. I doubt that it will last that long because it can be used for so many other dishes. It’s especially tasty on scrambled eggs. 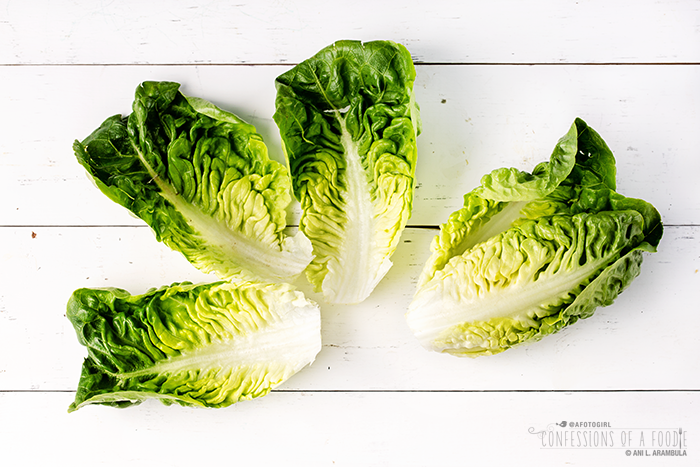 Suggested amounts of lettuce are if serving all 8 servings at one sitting to allow for leaves that tear or are too small to use as wraps. 1. Preheat oven to 400 degrees Fahrenheit. Pull out two large rimmed baking sheets; line one with either cooking parchment or a Silpat. Also, pull out a small rimmed baking sheet and set aside. 2. Cook the quinoa in 1 cup of vegetable broth according to package directions. Fluff with fork and set aside. 3. 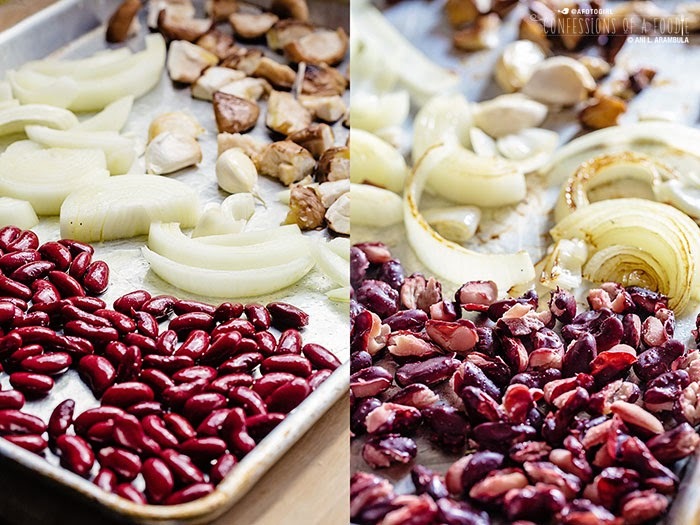 Spread the kidney beans, shitake and onions onto a large rimmed baking sheet. Drizzle about 2 tablespoons olive oil evenly over the beans and vegetables. Sprinkle about ½ teaspoon each of sea salt and black pepper; toss everything to coat well. Bake for 10 minutes; remove from oven and toss. Return pan to oven and bake an additional 10 minutes. Remove from oven and reduce oven temperature to 375 degrees Fahrenheit. 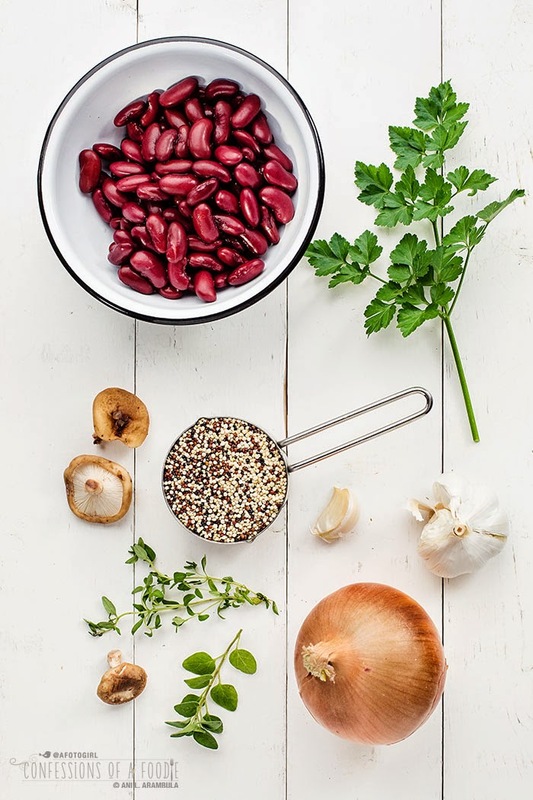 Add the beans and vegetables, 2 tablespoons olive oil, 1 tablespoon Worchestire sauce, the herb leaves and the nutritional yeast to the bowl of a food processor fitted with the chopping blade. Process until smooth and transfer to a medium-sized mixing bowl. 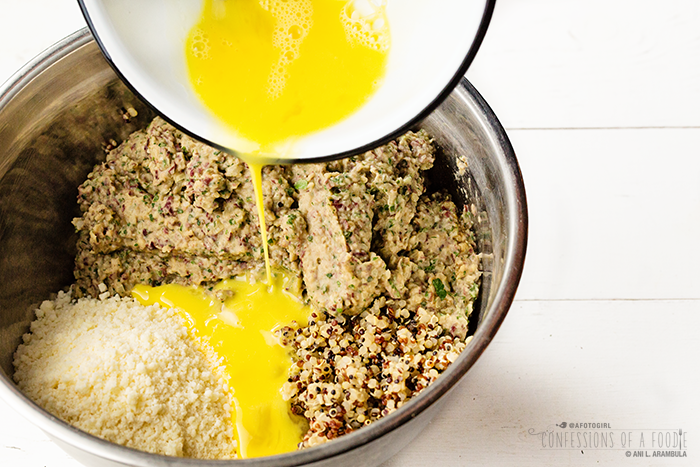 Add the cheese, quinoa and egg to the bowl and mix by hand to incorporate well. 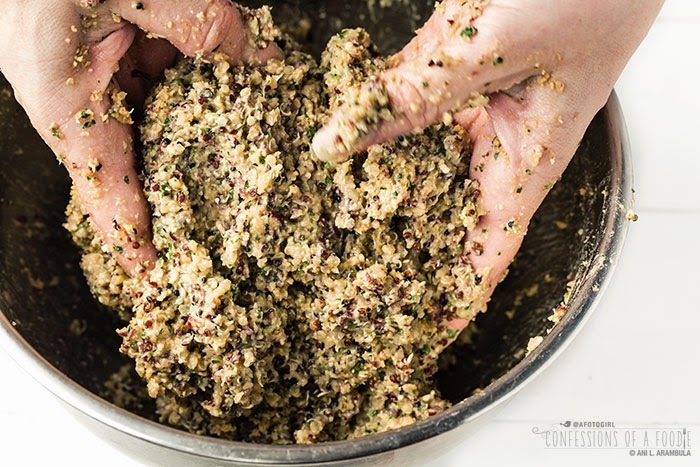 Using a 1 ½ tablespoon-sized cookie dough scoop, scoop out a leveled mound of quinoa mixture and roll between hands to form a ball. Place on baking sheet and repeat until all mixture is rolled. Placing balls about ½ apart you should be able to get all the balls on one sheet. Spray the balls well with cooking spray and bake for 10 minutes. Use tongs to flip balls and bake an additional 15 minutes or until lightly golden. Allow to cool in pan for 10 minutes before transferring to a serving dish. 4. While balls are baking, make pesto. Toss the walnut meats onto the small rimmed baking sheet and place in oven to toast for 8 minutes or until lightly toasted (keep an eye on these as they’ll burn quickly). Remove from oven and allow to cool in pan. Fill a medium saucepan halfway with water and bring to a boil. Fill a medium sized mixing bowl halfway with water and add several ice cubes; set aside. Add the basil to the boiling water and blanch for 30 seconds. 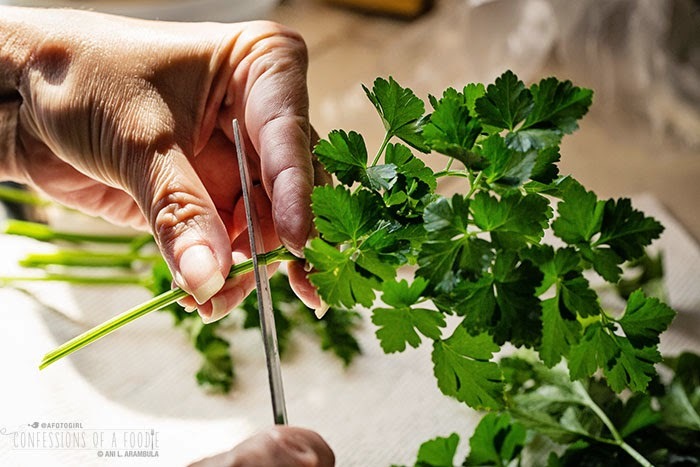 Remove the leaves with a slotted spoon and quickly drop into the ice filled bowl, submerging, to stop the cooking process. 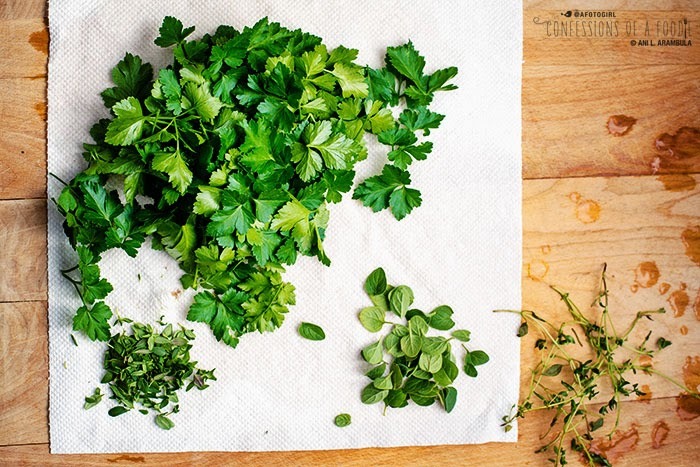 Transfer the basil to a salad spinner and spin to remove excess water (alternately, place leaves into a clean kitchen towel and press to dry). 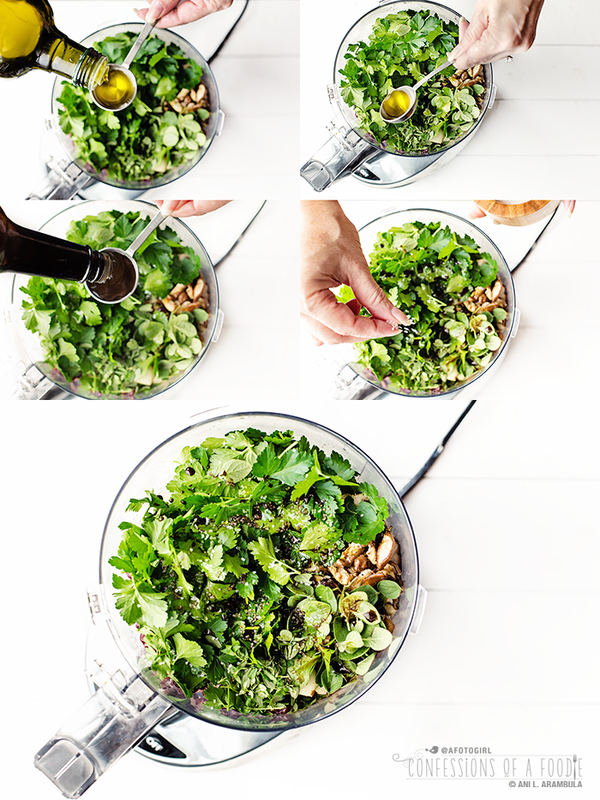 Toss the basil into the bowl of a food processor fitted with the chopping blade along with the toasted walnuts, arugula, cheese, garlic, pepper, lemon juice and olive oil; process until desired consistency, adding more olive oil if needed (I like mine a little chunky, so I don’t over-process). 5. 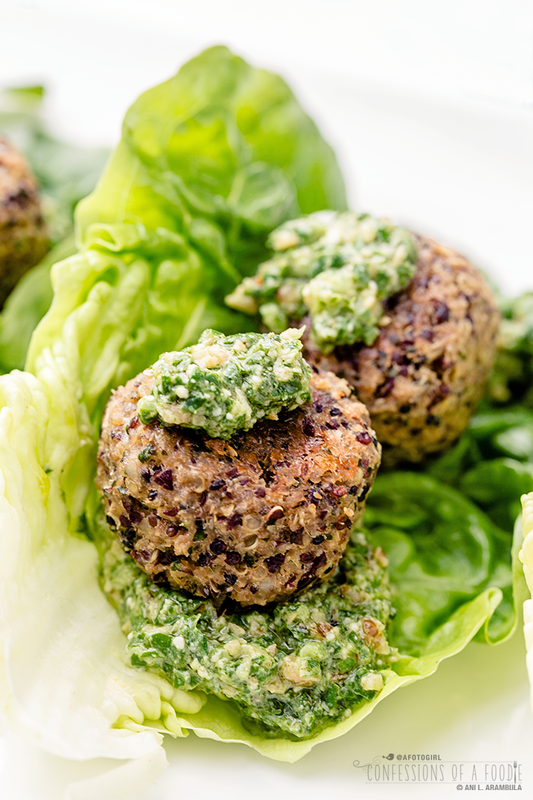 To serve, spread a tablespoon of pesto on a lettuce leaf; add two balls and top with more pesto, to taste. Serve to wraps per person. Only you, Ani, could make quinoa look so beautiful. 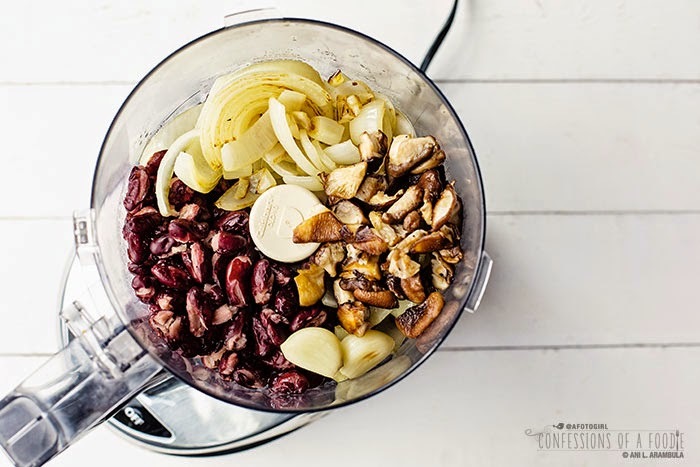 What a creative recipe and post - healthy too!